Do you want to see a real picture of “true love”? Right here. 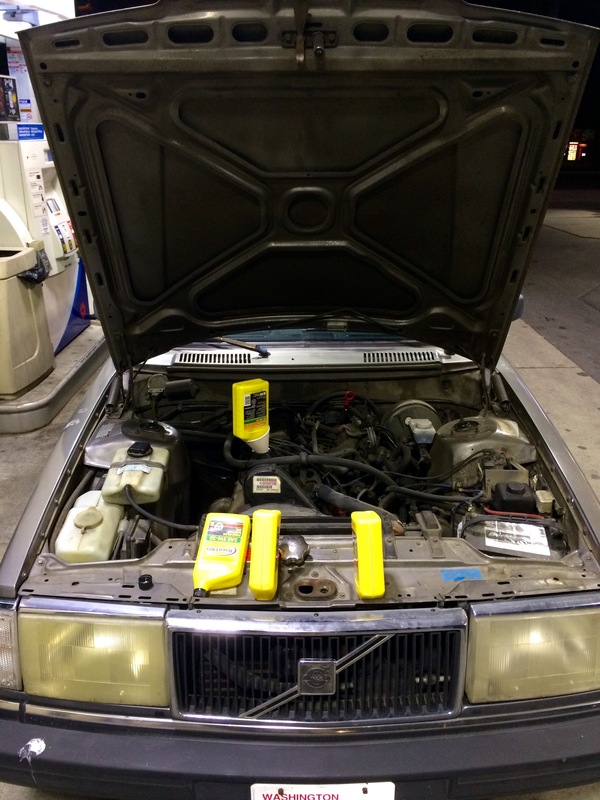 You’re looking under the hood of my wife’s ’86 Volvo parked at the AM/PM at 11:15 pm. Why? Because she asked me to fill up her car tonight so she wouldn’t have to do it tomorrow morning on her way to a work conference in Seattle. Of course I agreed, knowing that she would appreciate having that done for her. During the two minute drive to the gas station I noticed the “oil” light was illuminated. So, while the gas was pumping I popped the hood and checked the oil level. It was off the stick! Not good. Once done with the gas I went inside and bought four quarts of motor oil and poured them in. I understand that this story isn’t a romantic story like The Princess Bride, but it’s real life. Sometimes simply putting gas and oil in your wife’s car so she doesn’t have to and so it won’t break down is an expression of true love.